It just so happens that this time of the year we’re usually coming home from BC with a box of fresh BC peaches and the raspberries are a plenty in the garden at the farm. 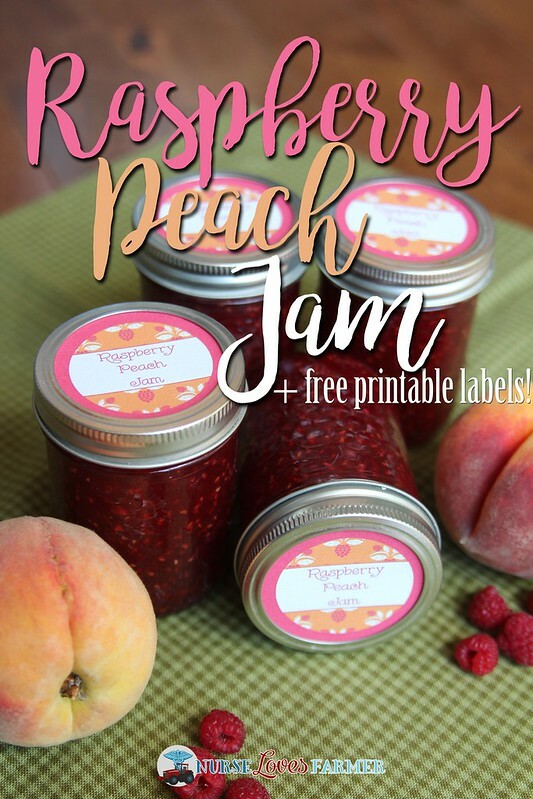 Last week I was re-sharing my favourite peach recipes on Facebook, and someone left me a comment that I should try raspberry peach jam, so I did — and it’s amazing! 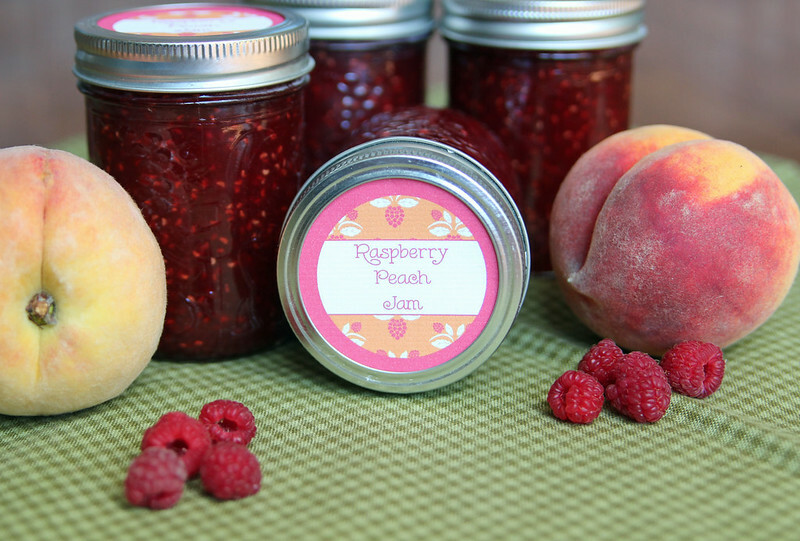 It is a beautiful combination: the tartness of the raspberries and the sweetness of the peaches for the best jam I’ve ever made! No pectin! I was skeptical at first, but if you put in the time to really reduce this jam, no pectin is needed. Prepare your mason jars — I got about 8 jam-jar-size (250 ml) — in a water bath (for more detailed instructions on these steps, read this post). Combine all ingredients in large pot (I find my oval Dutch oven works GREAT because it’s not too deep and my arm doesn’t get so hot!) and stir over over low heat until sugar is dissolved. Here’s where the work comes it — next, turn up the heat and bring it to a full-rolling boil and do not stop stirring for 15 minutes. You don’t want to scald the jam on the bottom, your hand will get hot and sweaty from the steam, but keep stirring! Once your 15 minutes are up, remove from heat and skim off foam if you have any (I didn’t). Remove hot mason jars from canning pot onto towel on your countertop and carefully ladle in the hot jam mixture leaving ¼” headspace. Remove the air bubbles, wipe the rim clean, place on flat lids and screw rings on to finger-tip tight. Make sure at least ½” of water is covering all the jars in the canner and process for 15 minutes. Remove from heat, wait 5 minutes, remove jars from canner and place on a towel on the counter. Check for a seal in 1 hour and any that have not sealed place in the fridge immediately. 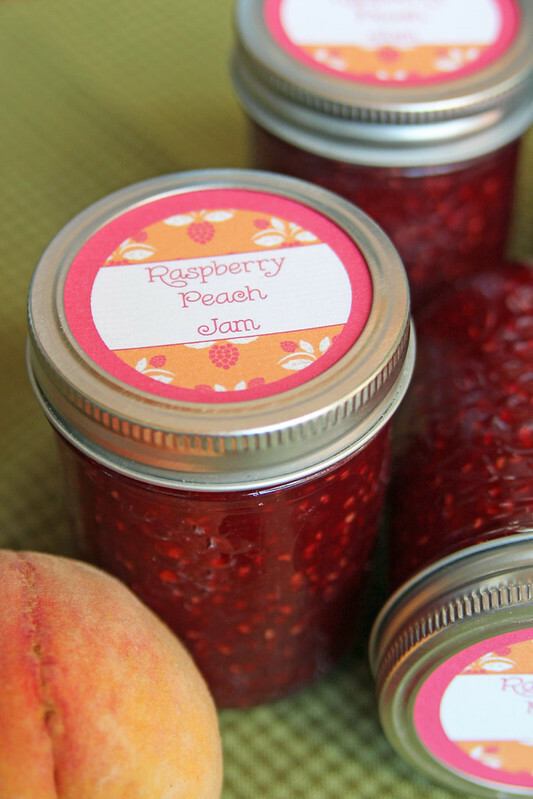 The tartness of raspberries is the perfect combination with sweet peaches for a truly remarkable jam! Prepare your mason jars --- I got about 7 jam-jar-size (250 ml) --- in a water bath. Combine all ingredients in large pot and stir over over low heat until sugar is dissolved. Turn up the heat and bring to a full-rolling boil and do not stop stirring for 15 minutes. Remove from heat and skim off foam if you have any. Remove hot mason jars from canning pot onto towel on your counter top and carefully ladle in the hot jam mixture into jars leaving ¼" headspace. Remove the air bubbles, wipe the rim clean, place on flat lids and screw rings on to finger-tip tight. Make sure at least ½" of water is covering all the jars in the canner and process for 15 minutes. Remove from heat, wait 5 minutes, remove jars from canner and place on a towel on the counter. Check for a seal in 1 hour and any that have not sealed place in the fridge immediately. Please feel free to print and use these labels but they are only for personal use; do not save and upload them anywhere else. Right-click and “open image in new tab” for full size image to print. I really hope you enjoy this jam as much as I do! « Jonathan is 3 Months Old!